Once in a while I cross paths with someone who is keenly interested in becoming a beekeeper. The draw of fresh honey, the lure of well pollinated gardens, and just the romance of it all is more than enough to make people at least inquire about the craft. Lots of people, after visiting us at the State Fair beekeepers’ booth, start attending monthly club meetings. Are you one of these sweet souls? Does any part of you want to know more about how to dive into this field? Today’s post is for you. Welcome! As I type this, Oklahoma is forecasting a chilly Halloween weekend. That means true autumn is right around the corner, and winter will follow closely on her heels. And we all know that winter is prime time for planning. We plan our resolutions, our springtime vacations, our gardens, our reading lists. We might even plan how to lose some weight and reorganize the house. Well, winter is also prime time for planning your new apiary! It’s the springtime when things really start hopping, so learning and preparing now is ideal. Watch some You Tube videos posted by popular beekeepers. Tutorials abound! Our club president James likes a guy on You Tube who calls himself “The Fat Bee Man.” Here is a fun video to start you out. Attend a couple of local beekeepers’ club meetings to get acquainted with like minded folks (or follow those groups on Facebook). Click right here for a list of Oklahoma clubs. I belong to the Frontier Association and consider these fine people my friends. I think all clubs would welcome guests for free. Study your landscape and decide where the hives will be best located. I searched for a site with decent wind protection but no overhanging trees, full sun exposure, and good openness in both the east and west for the bees to enter and exit the hives freely. 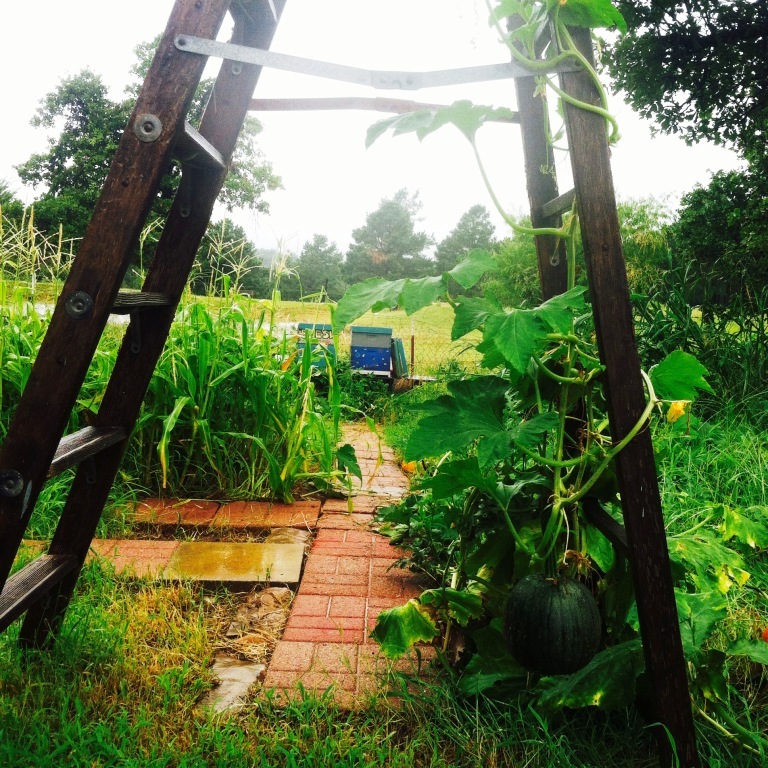 Also, I had an epiphany this year was able to place my hives inside the veggie garden. Double wonderful! Prepare the site, assemble and paint your boxes, etc. You might want to build or place a low table or board-and-cinder block support so your hives are off the ground but not too high for you to reach. Check with local ordinances as to whether or not you are allowed to keep bees. I added that bit about local ordinances last for a reason. Most people are nervous about having honey bees in close proximity. Although honeybees are less likely to be aggressive than, say, wasps or bumble bees, and although true bee allergies are extremely rare, just mentioning backyard beekeeping will almost guarantee you a dramatic, anxious reaction from somebody. So most beekeepers like to say (as a total joke!) that it’s better to ask forgiveness than permission. And do ask forgiveness while presenting your nervous neighbor with a jar of honey. Again, this is a total joke. Please do check your local ordinances, ok? Okay. But the honey-gifting is a great idea. 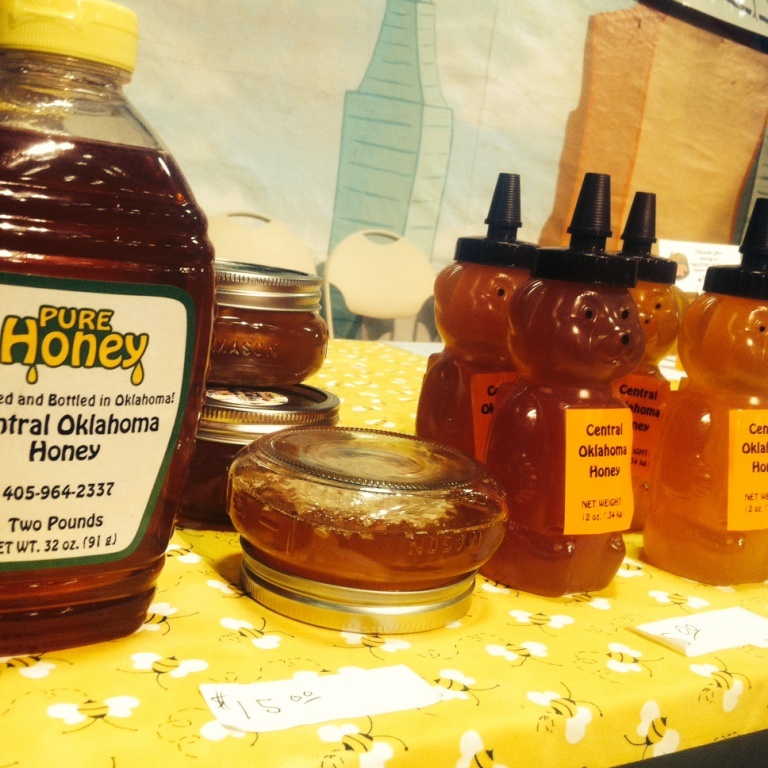 In April of 2013 when Oklahoma was lobbying to pass a honey sales act, hobbyist beekeepers presented jars of their molten treasure to local lawmakers and got wonderful response. Not only did the bill pass; I would bet that those folks also gained customers and friends. So plan to be generous when the time comes! 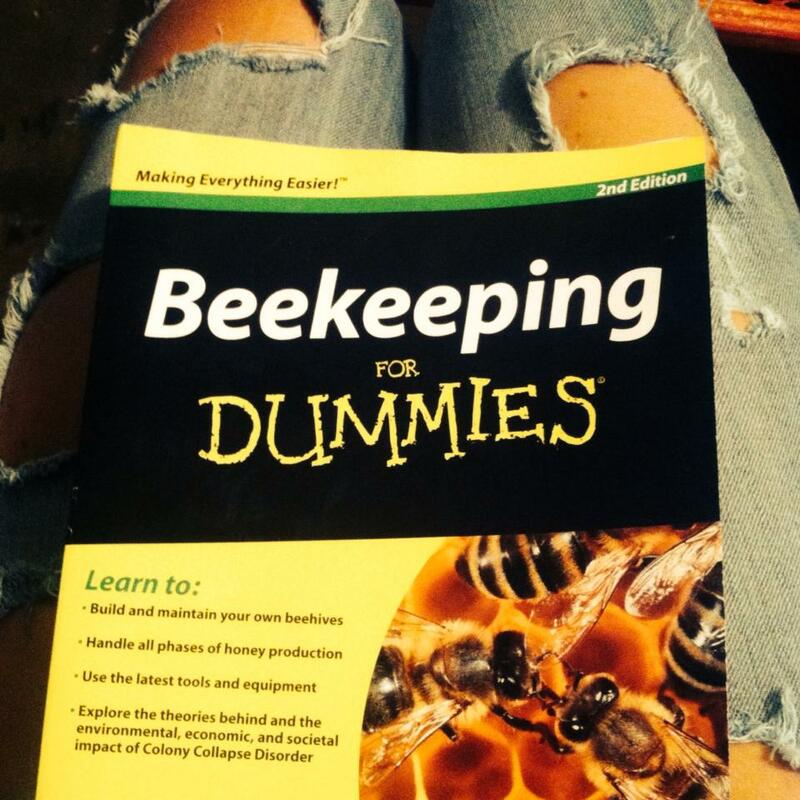 Beekeeping for Dummies My Dad gave me a copy of this and I reference it often! No matter how the title makes me feel. The American Bee Journal This is both a print magazine and an excellent website. I think if you take certain classes locally a subscription to the periodical is included with your paid fee. Bee Culture Also both a print magazine and a website favored among apiarists. The Beekeeper’s Bible by Richard Jones and Sharon Sweeney-Lynch. My friend Heather over at Last Day Ago recommends this. She says, “It is beautiful and leaves no stone unturned. Heavy and huge, color photos on every page.” I’m sold. The Honey Bee, a Guide for Beekeepers by V.R. Vickery I like this book because it also offers lots of interesting history. Beekeeping is, after all, an ancient practice and one that has not changed much over recent centuries. How many fields of study can say that? We’re close to nature. My great-grandfather’s apiary journal He was a pretty well known beekeeper in northeast Oklahoma back in the seventies and eighties, and I happen to have his handwritten diary. It’s full of information and ideas! Such a treasure. Now I realize you don’t have access to it, but I will occasionally post insights and updates from it here on my blog, so please always feel welcome to check in! Is it dangerous? That’s just a matter of perspective. The dangers are tiny and far outweighed by the benefits. How much will it cost up front? Ordering the actual bees will cost between $90-$120 per NUC (the start of a colony, including a queen). Then purchasing the woodenware and basic manual tools could cost you up to $200. From there, ongoing costs are pretty nominal. You will find that beekeeping friends are generous and thrifty, and compared to hobbies like gardening or car restoration, beekeeping is quite cheap. The only real ongoing expense is sugar. Ask my husband sometime how he feels about that. 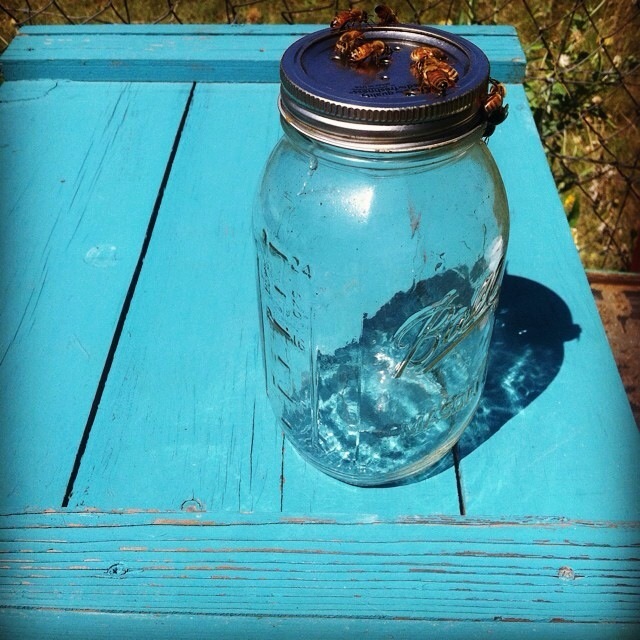 How much time will I spend tending the bees? It seems like a few times per year you might spend the better part of a day, several days that season, doing pretty focused work with your hives. Mostly in the springtime and again at honey harvest, which is summer’s end into fall. But tending bees is not a daily or even weekly task like you would have with other animals; they do well on autopilot as long as they are healthy and well provided for. But you may find yourself frequently sitting near your bee hives, listening to the buzz, inhaling the perfume, and allowing them to lull you with their rhythm. What about bee population decline, how do I fit into that? This is certainly a global problem, but you keeping even just one or two hives of honeybees means you are part of the solution. 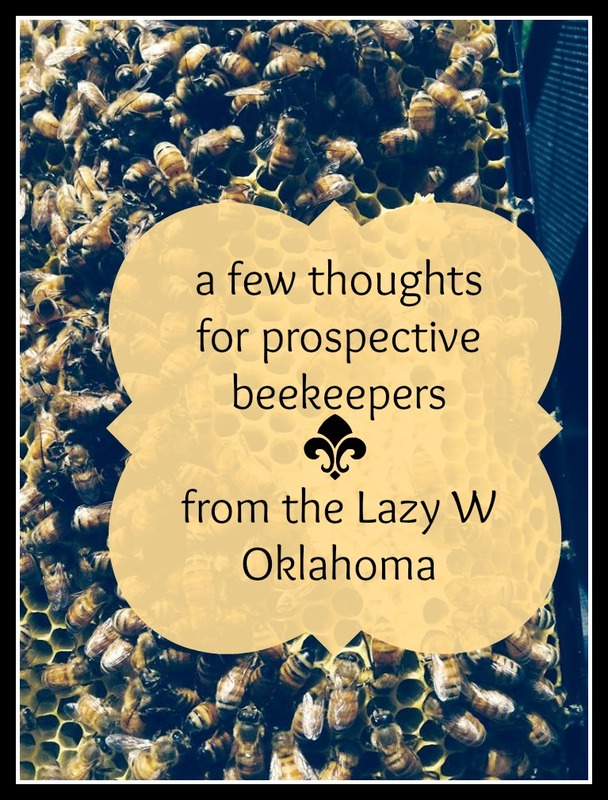 And the honey community at large, particularly here in Oklahoma, is making great strides in understanding and overcoming obstacles. What if my bees are Africanized or “killer” and then National Geographic wants to come tape shows about how awful and dangerous they are and maybe William Shatner wants to do a movie abut it for ScyFy? That is unlikely to happen if not impossible. But I applaud your imagination. What if I get stung? “Plumbers get wet and beekeepers get stung.” ~Rick Schantz You will eventually, probably sooner than later, get stung. And it’s not that big of a deal. Consider it a rite of passage or a badge of honor and get some Benadryl if you must. You’ll be okay. Where do I go with questions? You can text Maribeth like 24/7. Just kidding! She’s my mentor and I don’t really want to share her generosity. Foster a relationship with someone you like and acquire that person’s cell phone number. Also get comfortable with websites, forums, etc. You’ll be amazed at how easily you can find solid, comforting information. You can always contact me, and together I bet we can find the answers. The Lazy W Honeymakers also love the color turquoise. They told me so. So much magic and history surround this art, so much science and possibility, that if you are even slightly interested you really owe it to yourself to dig a little. See if the spark can be fanned into a flame. And surely you already know how vital honeybees are to global ecology! Maybe you even owe it to the food chain to do your research and decide that you, too, are a beekeeper at heart. 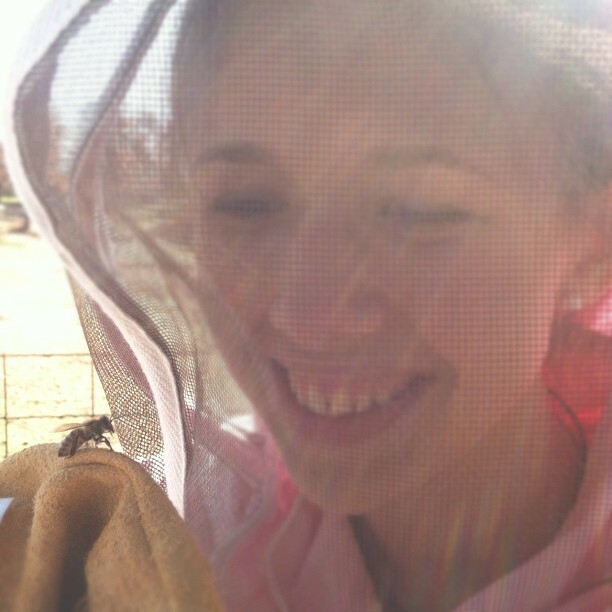 My youngest holding Fred the Bee, about three years ago now. Thanks very much for reading today! Obviously I have fallen deeply in love with the art, science, and community of beekeeping, and I am thoroughly enjoying the slow process of carrying on my Papa Joe’s family traditions. I hope you have found some things in this article that inspire you to at least look around and educate yourself more. Beekeeping is a beautiful, worthwhile endeavor and something we need more people to try. Hugs from the Lazy W! Hi! I’m Marie. This is the Lazy W.
A hobby farming, book reading, coffee drinking, romance having, miles running girl in Oklahoma. Soaking up the particular beauty of every day. Blogging on the side. Welcome to the Lazy W! Would you like a little dose of the Lazy W in your email? Follow Marie Wreath's board Gratitude & Joy Seeking on Pinterest.